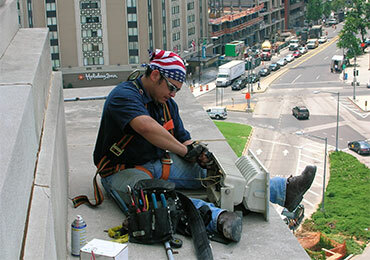 Direct Current has provided electrical service to commercial properties in Arlington, Alexandria, and throughout the Northern Virginia and DC Metro area since 1991. We work on and in office buildings, retail, apartments, hotels, condos, critical care facilities, restaurants, warehouses, schools and government facilities. We can design and install any type of electrical system required in your commercial building, and are happy to service and repair your current electrical system. We install high-efficiency systems designed to be the most cost effective for your property. We are committed to building the most reliable electrical system for your needs. Complete retrofit of the parking lot lights from metal halide to LED at The Lab School in D.C.
Upgrade lighting to LED and ACC standards in The Lab School Gymnasium in D.C. Complete retrofit of gym lights to LED at The National Presbyterian School. Upgrade 100 KVA standby Generator with ATS at the Thoreau Place in Reston, VA.
30KW standby and distribution system at the U.S.P.S. stamp distribution center in Dulles VA.
A 40,000-square foot center and a 10,000 child care center with all tenant build-outs including dentist offices and restaurants at 201 & 205 N. Maple Ave., Purcellville VA.
100KW standby generator, 80KVA UPS and Data Center distribution system at 7600 Colshire Dr., Mclean VA. The swap-out of one and the installation of another 125KVA PDU without power interruption at 4795 Meadow Woods Lane, Chantilly VA.
Design and install grounding and surge protection system at the National Presbyterian Center, 4101 Nebraska Ave., NW D.C.